Yes, I tossed all night. I don’t remember what I dreamed, but I woke in a cold sweat, the muse whispering a line over again in my brain. A new first line for my novel. It was a simple sentence, yet the impact of those few words would set the trajectory of the novel into it’s rightful path. It encapsulated the spirit of my story. It was my “dark and stormy night” line. It was perfect. Stumbling down the hallway with one eye shut, I made it to the kitchen to my phone. What the hay? Four in the morning? But I couldn’t forget that line. I had to write it down. And fast. I changed the first line. From there, more lines had to be polished to fit the simple excellence of those first words. And so on. I worked until daylight and the hours beyond. If you’re a writer like me, you well know that when these brilliant moments come, you hope it won’t ever stop. You keep writing, pounding away at the keyboard or scribbling words until your hand aches, because it’s such a beautiful thing you don’t want the magic to end. And this is the clincher: Some of those magic words, even the ones you couldn’t imagine parting ways with because they’re just that amazing, will eventually be erased, deleted, thrown in the scrap folder. And it’s okay. It’s how we polish our craft. Something else happened the morning the muse spoke to me. I had this epiphany of sorts. And believe me people, this is big. As writers, when our work is rejected by editors and agents, it is not personal. Can you believe I just wrote that? Honestly, I’ve been adamant. I’ve always felt it was personal. But it’s not. This is how I know: After writing all of the magic words, falling in love with them, and then realizing their destined for scrap, only to replace them with more wonderful, beautiful words, and not giving up, and not being defeated; only one thing will happen. So what does this mean? How does this relate to the rejection not being personal? Because the editors and agents are looking at our work while we’re in the process of perfecting our craft. All of us are at different levels. True, some may have more natural talent than others and some may have invested more time and education into their art, but whatever the case, the final product we showcase to editors or agents is the best we can share at that given moment. But still, it may not be finished. It may not be ready. So once again, we toss the magic words, replace them, and so on. And we keep going. And eventually, someday, all of the elements will fall into place: plot arc, characterization, strong dialogue, rising action with good conflict, a strong climactic ending with lots of resolution in the denouement. And at last, I believe, someday someone will notice. That’s why our rejection letters (for the most part) become more promising as we blossom at our craft. In this way, it’s not personal. It’s just a matter of finishing the job. When we receive a rejection there are a plethora of reasons why. We’ve heard them all before. It’s a subjective business, the genre may be overdone, it won’t sell in today’s market, etc. and so on. But if we keep working and exceling at our storytelling by making those magic words leap off the page in a glorious blaze of light, one day the ultimate goal of a shiny new publishing contract will happen. When you first arrived in a swirl of snowy icicles I welcomed you with hopeful anticipation. There was so much to look forward to. Remember? I told you my wish. How I hoped my family would grow and learn and keep believing in our dreams. That we would share goodness and kindness and joy with others. And we would try our best to approach your year with humor and graciousness, even when things became difficult. So thank you 2016 for accommodating my wishes because as you now depart, once again in a whirling blasted breeze of ice, all of those things have come true. But it hasn’t been easy, especially since there have been formidable challenges, wall-like obstacles and we’ve even lost a few friends along the way. You’d probably agree that in my writing life, things went up and down. On the downside, I didn’t sell a book in your year. But on the upside, I had an agent working tirelessly on my behalf, and for that I am profoundly grateful. Though, in the capriciousness of your year I had moments of pure rewriting dread. Receiving feedback on stories, being told they’re not ready, shaking off the self-doubt, and continuing on with grace and dignity is not easy. But thankfully, as I say goodbye to you 2016, the dream is still alive. In the fall of your whirlwind year, one of my short stories was accepted to be part of the Smithsonian Institute’s Water Way exhibition in our new library. It was posted for several months and as the traveling exhibit moved on to its next destination, there was a nice reception in honor of the occasion. You also brought some unexpected surprises. My parents left behind their little RV in the sunny west coast and bought a place in a senior park here in the northwest. This development changed the dynamics of our family life for the better. During the springy springtime of your year we calked and painted and made their new place beautiful. They bought the trailer for only nine thousand dollars, but now it looks like a million bucks! And you gave us a wedding to look forward to. Remember when Melissa and Victor got married in the Rose Garden, her grandfather officiating? So pretty. Last of all, my dear 2016, we leave your year behind along with a few of our treasured friends. Ray Harriman was a mentor to both my husband and I, giving our life direction when we needed it the most. A good man. A spiritual man. The strength of his conviction will fortify us during the years to come. We’ll miss him sorely. Also, tragically you took our friend McCall Jones. Only twenty years old. Hiking with his friends near a rocky cliff in Hawaii, he fell into the ocean, swept away by the roiling waters. His body was spotted by a rescue helicopter, but McCall was unable to be recovered. We are deeply saddened by this horrific accident. At his funeral his mom said, “McCall loved you.” Those words I will cherish always. My last parting words to you are true. You only promised that days and months would go by, and it was up to me to make them worthwhile. I hope I did. But for now, I’ll end this letter wishing you well with the hopeful expectation that 2017 will be kind to us all. It’s true. Opening night of ROGUE ONE, with pre-purchased tickets in hand, we arrived super early, ready to wait on a very long, fan-filled line, adrenaline rushing through our STAR WARS adorned bodies. In fact, my twelve year old son has an app that’s been counting down the minutes and seconds to the highly anticipated newly released blockbuster, and as a family we approached this day as if it were a holiday. My husband took off work the following day, my son school, and I cleared my schedule so after the eve of opening night, the next morning we could bask in the aftermath of the movie, dissecting what we saw, discussing what it meant. Mind you, when I was a little girl and Star Wars Episode IV, A New Hope was released on May 25, 1977, my parents took my brother and I to an old theatre on the eastside of our dusty town, and I remember watching those starships battling in a “galaxy far, far away.” But I wasn’t impressed. I remember thinking: Wow, what a corny idea. Boring. All these space battles are making me tired. Maybe I should take a nap. Today, when my husband and son hear me describe my early opinions of Star Wars they say those views are paramount to being sacrilege. So, honestly, they are the reason I’m a fan today. They helped me to expand my galactic horizons. A foreshadowing of how Star Wars would effect my life came before we were married. It was just a few weeks until the wedding day and the time came to move my personal belongings into my future groom’s apartment. Above his bedpost, a huge Star Wars poster from Episode IV, hung on the wall. I thought: No, no. I’m not going to sleep every night with a scantily dressed Princess Leia, Han Solo and these other unsavory characters looming above my head. So I took the poster down and replaced the open wall space with a black and white portrait of two small boys running away from home. One of the little dark-haired boys reminded me of my future husband. It was a sweet portrait. At least I thought so. When my groom saw what I did-well-let’s just say it’s amazing we still got married. He wouldn’t forgive me for this nearly unforgivable faux pas for many, many years. The reason being: When I removed the poster, unbeknownst to me, the paper ripped and it was ruined. I felt especially terrible because it was a rare poster and not easily replaced. But one anniversary, years ago, I found it, had it professionally framed and now it’s hanging on a wall in his office. When you walk in his office, one entire wall is floor-to-ceiling windows with a beautiful view of our state capitol building among rolling foothills. But get this. His desk faces the wall, where you guessed it-where his Star Wars poster hangs. His clients sit in the two armchairs under the poster. That’s what Star Wars means to my hubby, and now my son is following in his footsteps. At first, I didn’t get it. But last year, when Episode VII, The Force Awakens released, our theater ran an all day Star Wars marathon. Okay, now you’re going to see the strong influence my two boys have had on me. The first movie, Episode IV, A New Hope, the same movie I took a nap in as a young girl, started at 3:45 a.m. Yes, you read that right. I had to wake up at three o’clock in the morning on a snowy winter’s day, maneuver through treacherous road conditions, to see all six Star Wars movies in a row, and at seven that evening the release of Episode VII, The Force Awakens. And you know what? I loved every minute of it. I get it now. It’s the classic and timeless storyline of Good vs. Evil. It’s about unconditional family ties, an enduring hope, and the powerful “force,” drawing out our innermost desires. It’s not just about space battles, it’s about the pull we all have to decide if we will do what’s right, even when it seems impossible to do so. Even when darkness is stronger than the light. Yes, I am a Star Wars fan. And proud of it. M.R.I.’s Are NO Fun (Really) . . .
My mom rolled deli ham into a slice of cheese, insisting it was low blood sugar. I felt off the whole day, but that night it really got weird. I went to write in my journal and lost the ability to write! Yes, this writer couldn’t write. My hand moved awkwardly across the page, struggling to form the words. The same as my awkward speech, my hand wouldn’t move the right way to form the words on the page. My fine motor skills went flat! I freaked out and looked online to see if this meant anything. Everything I read was scary. Words like “stroke” and “palsy” didn’t sound good, but still thought it might be low blood sugar. That night, I woke up by a headache on the right side of my head only. And I felt dizzy. It wasn’t excruciating, but it bothered me, and was bad enough to wake me up. I shuffled to the living room and sat in my favorite chair for awhile, hoping it’d ease up. The headache went from dull to a bothersome ache that required medicine a few times, but I kept thinking it’d go away. After a few days, even the meds wouldn’t make it feel better. So finally, last Tuesday I woke up at 5 a.m. with my head (right side only) still achy and feeling dizzy. I took a shower and got dressed because I felt nervous and thought maybe I should go to the ER. Okay, okay, I KNOW! Should’ve done that right away. Note to self: Don’t wait next time! But I didn’t go to the ER that Tuesday morning. Instead, I tried to write in my journal to see if my writing skills were still in tact (my handwriting was only affected that first day), and it was fine. My hand was able to write. Maybe it was just a tension headache. Although, over those same few days, whenever I was working on a manuscript the page would move or jump. That dizziness wasn’t good. Finally, at last, Tuesday evening after my family met for Taco Tuesday at a local restaurant, I told them I was going to the ER. The headache wasn’t getting better and the dizziness was a concern. They agreed and thought I should’ve went much, much earlier. Oh my, the on-call doc waved a pen in front of my eyes and tracked my eye movements. I couldn’t do it. The eye jumped and crossed and was basically weird. I couldn’t track his pen. It made me queasy. He asked the nurse to put an I.V. in my arm and said he had lots of tests to order, it could be a while. By now, I should’ve been nervous, but I was just tired and wished to be home. I had a book with me (of course, I always have a book with me), but I couldn’t read it. I texted my family to let them know what was going on. It took over five hours. The CT scan, x-rays, blood work, I.V. wasn’t bad. But the M.R.I. – was very scary! I never had one before. Honestly, by the time it was ordered, it was late in the night, so I just kept my eyes shut. I never even looked at the machine. The room felt cold, and if a place could feel sterile, that’s how it felt. The nurse led me toward a bed that felt more like a table. She said a contrast would go through my I.V. twice within minutes of each other, feeling cool to the skin. She ran a solution through the I.V. so I could know what it’d feel like. That was nice, I thought. With my eyes still pinched shut, I felt her lay a warm blanket over me. That was really sweet. She put a device in my hand that felt like a small rubber ball and said to squeeze it if I needed her. She wouldn’t be able to hear me during the procedure. I held it close to my chest. She also placed earplugs in my ears and headsets over my head, asking what type of music I like. Wow, this is really nice, I thought. Music? Warm blankets? It’s like a spa. As the bed/table began to buzz and raise, the nice nurse says, “It’ll be 25 minutes.” Twenty-five minutes? I thought this was a five minute thing. Before I could protest, the bed/table moved and stopped. Machinery made loud jackhammer type noises all around me. The bed/table moved again, and although my eyes were still shut, I could tell I was being moved deeper in the machine. It wasn’t even like I had earplugs in my ears. The noise. It vibrated and pounded and jackhammered. It stopped and started again. It was terrible! I tried to make myself calm. I prayed. I sang. I could feel the machinery all around me. I peeked open one eye. Oh my goodness! Bad move. The ceiling. Only inches from my face. But there was a light. I shut my eye again. My body began to shiver and shake. My teeth began to chatter. I was suddenly terrified. I needed…I had to get out of there! I had to squeeze that ball, let her know to get me out. But I resisted that feeling and kept praying. The contrast was cold. Ice through the veins. It wasn’t that bad. Just strange. But soon after, it was over. The machine pounded, grinded, bumped and hammered away and the bed/table moved and lowered. I made it. I lived through my first (hopefully last) M.R.I. So an hour later, curled up on the hospital bed, clutching my phone with my eyes shut, the doctor comes in and says he was concerned. My symptoms and eye palsy made him think I had a tumor or Multiple Sclerosis or a stroke. He really thought he’d see something in the M.R.I., but it was normal. Every one of my tests were normal! I clapped. Yes, I actually clapped. Great, I’m going home, I told him. Just take this blasted I.V. out of my arm and we’ll call it a night. Thanks for your help. Gotta go. He says he has to check with the on-call neurologist first. They’d like me to stay and do a Lumbar Puncture: A needle in the spine that withdraws spinal fluid. What? Needle? IN SPINE? He says, if I make an appointment with my neurologist ASAP then I can forego the tests for later. And I say, YES. OKAY. GOOD IDEA. I got home about midnight, had a seizure (I’m epileptic) at 3:30 in the morning and was sick all the next day, but I still made an appointment with my neurologist for that same afternoon (they squeezed me in). She says it was a migraine. Wow, that’s it. All that torture for a migraine. What about the dizziness? The eye palsy? She says migraines don’t typically have that symptom, but she still feels it’s a migraine. This is my M.R.I. story. But I’m grateful that it’s over. I’m grateful that it was just a migraine. Very grateful that I didn’t have that Lumbar Puncture do-hicky thingamagica. And extremely grateful that, for now, all is well. The Nine Lives of Leo..Tortoise Extraordinaire (seriously) . . . Mind you, Waterbay is blocks from our house where Leo had first escaped. My son and I jump in the car to head over. No dice. He was last seen by an elderly neighbor who reported he placed him by the pond by the ducks, but he’d since left. Leo probably isn’t a duck person. Disappointed, we headed home. And for the next two days we scoured Waterway and the neighborhood beyond. But just a few minutes ago, our doorbell rang. Who was coming to dinner? It was LEO. Our neighbor said he was walking in the middle of the road toward our house. Is he bright enough to remember where we live, or did he happen to circle back to the exact right street at the exact right time. Again? Leo must be part cat. Seriously. That’s us. We are no good, really rotten tortoise owners. Poor, poor little Leo. 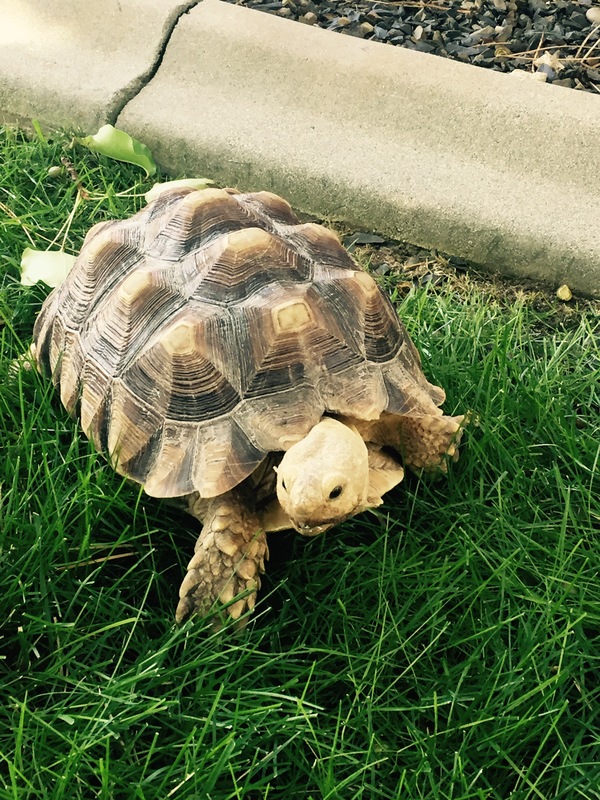 Our African Sulcata tortoise, Leonardo da Vinci, is missing. And as some of you may already know; this is not the first time. Two years ago, I was yakity-yaking in our backyard to a young friend (he was lamenting his girl troubles), when little Leo escaped through our rod iron fencing and went missing for 40 days and 40 nights. Literally. And like the GREAT FLOOD his awesome adventure was proportionate to the epic waves crashing higher than the summit of Mount Everest. But he lived. He lived to roam every bush, shrub and flowerbed in our neighborhood’s cul-de-sac. He lived by subsisting on freshly manicured lawn grass and drinking water from our finely-timed lawn sprinklers. But at last . . . Leo is gone. And I fear . . . for good. It’s only been a few days. But for some reason, I have this feeling. A BAD feeling. My response: “Oh man! The lawn guy must’ve left the hole (the space under the iron fence) open.” She was kind enough to keep watch over him as I quickly made my way back from a local restaurant. We barricaded the hole with a meshed screen. A flash of heat crawled up my neck. I apologized (profusely) and sent her a sorry/thank you note and a jar of local organic honey. We added a large plastic sheen to the barricade. I went to pick him up, and he snapped his head back inside his shell. After lifting him, I thought: This little tortoise is getting heavy. Probably a good six/seven pounds. And he’d grown a whole lot. A lot. How much manicured lawn grass was this guy eating? He was the size of a large dinner plate. Not long after, our third neighbor in the cul-de-sac, Little Macy from across the way; knocked on our front door. “Your turtle is at my house,” she says. This time I wasn’t messing around. I hammered a line of posts across the hole under the rod iron fence. And my neighbor was thoughtful enough (or just plain tired of seeing him escape) to place a wooden plank across the posts. No-siree-bub, there was no way he’d escape now! I walked over to her place. She proceeds to point out how the wooden plank and posts have been bulldozed over. A little tunnel had opened up between the plank and posts leading to my front yard. I thanked her, once again, thinking I best start stocking up on thank you cards and jars of organic honey. My son searched our backyard, combing every inch. I did the same. He was gone. Really gone. Yes, Leo is officially missing. And yes, we are indeed bad, very bad tortoise owners. But a tortoise who can escape like Houdini can surprise us all and someday magically reappear. Or sadly, maybe he won’t. A half an hour before sunset on his Texas ranch, Humphrey Herbert Plumtree sits on a leather recliner in his country home in Marble Falls. As the main character in my newly revised middle grade book, H.H. Plumtree’s Best Worst Day he transforms on many levels. As the room darkens, Humphrey leans over to switch on a bronze lamp. Lamplight glints on his vintage eyeglasses as he drawls polite answers to my questions. He places a bottle of root beer on the wagon wheel coffee table, avoiding the coaster. Blog Reporter: No coaster? In the book, H.H. Plumtree’s Best Worst Day, you seem so fretful. So worrisome. I never placed you as a no coaster type of guy. Blog Reporter: I’ll say, without spoiling the book, that you sure become more daring as the book goes on. HHP: Yeah, I do. My friend, Maribel, helped me a lot. Blog Reporter: Do you and Maribel still spend time together? HHP: After all we went through, I was worried. Maybe being my friend was too dangerous for her. But no, she’s stuck by me. Blog Reporter: So, most of our readers today don’t know anything about your story. What, if anything, can you tell us? HHP: Last year when I was ten, we flew to California and my parents went to a geology conference. They didn’t want me to become bored in the hotel room, so they dropped me off, you know, at the curbside of an adventure park. Blog Reporter: Wow, sounds like every kid’s dream-come-true! HHP: You’d think that, huh? Have you even been to an adventure park alone? It’s not as fun as you’d think. Plus, I had company. You know what I mean? Blog Reporter: I do. But your readers today may not understand what you mean. Are you speaking of the shiny-shoed man? HHP: Yes siree, I certainly am. I came into this story with some secrets, but my parents had a few secrets of their own. Blog Reporter: What kind of secrets? HHP: Well, I’d tell ya, but then I’d have to murder your houseplant . . . get it? Murder your houseplant, like Mother did to my older sister Lanie’s plant. HHP: Yeah, but it wasn’t all bad. That’s how Maribel and I became friends. Blog Reporter: True. If this book gets picked up by an editor, I’d like to do another interview with both you and Maribel. Do you think she’d be game? HHP: Heck, yes. She loves the limelight, way more than I do. Blog Reporter: Excellent. One last question. My next blog interview is with Abigail Rose Calantro from my other middle grade novel, THE WANDERINGS of Little Abby Rose. I heard you all had a chance to meet? Is that true? HHP: Yep! A few weeks ago, I was visiting my sister, Lanie, in New York City. While hanging out at The Plaza Hotel in Central Park, I met Abby and her family. They’re great people. Blog Reporter: Nice. So, you make a cameo appearance in her book? HHP: Yeah, I do. It was an honor. Blog Reporter: Thanks for taking the time to chat with me, Humphrey. I look forward to seeing your book out there someday. Stay tuned for my next blog interview with Abby Calantro from THE WANDERINGS of Little Abby Rose. She’s a feisty eleven-year-old girl who has much to say about her Latina family’s curious adventures. Hello, my name is Thankfullness . . . Some people shorten my name and refer to me as Thank you, Thanks, others Thx, or I have even seen during text messaging, TU, which I believe if switched around is also the abbreviation for a university in Texas. But either way, whenever and whichever way people refer to me, it makes me happy when they do so. I exist between the clouds and sky, watching gleefully, observing random acts of kindness, unexpected and even anticipated little surprises given, and the human race at its finest. Though recently as I flurry here and there across the atmosphere of the earth, a faint and distant alarm, profound and uncomfortable rises in my typically untroubled and carefree soul . . . more and more I am being referred to less and less. In some parts of the world there is a day when groups of people gather and use my name more than usual. They do so along with feasting on a grand amount of turkey and other, what they refer to as “fixings,” wherein they unbuckle and loosen their trousers and lounge on a sofa watching a sport called, football. In parts of Asia families refer to me during a visit to the graveyard of their ancestors and celebrate by indulging, once again in a “bountiful banquet of food,” and then dance about in a circle. But just recently I have noted a string of opportunities for people to use my name; a random act of kindness, a favor for a friend, a gift of hospitality, and the receiver(s) said nothing. For example, two men were installing an air conditioning unit for a family when the lunch hour approached. One of the family members offered to run to a nearby sandwich shop and purchase food for all. He even offered the workers their choice of sandwich and drink. They placed an order and handed a few bills to the family member. He refused the money and said, “No, please, it’s on me.” The worker put his money back in his pocket and replied, “Okay.” The other worker did not volunteer any money at all. When the food was delivered a few minutes later the workers took the food and did not even peep my name, not even a whisper of it. I was diffused. Not long ago, a father and son asked another parent and their child to spend an afternoon at a carnival and cornmaze. The father was excited to show hospitality to the other parent by purchasing their carnival and cornmaze tickets. Though, the other parent and child, after enjoying a pleasant afternoon together, walked away and never said my name. And sadly, I believe they did not even think it. There are more, many more stories to be told in this regard, but I hope that people won’t forget about me all together. Because if they do I will eventually become nonexistent, and in time . . . fade away and disappear forever. It’s not Monday with its beginning of the work week blues. It’s not Wednesday, or “hump day.” Never really liked the sound of that. Thursday my husband doesn’t eat. It’s his way of controlling his weight. Friday is nice. But there is always the expectation TO DO something nice. Saturday is good, but always busy, like a “catch up” day. Sunday is sweet, filled with grace and goodness. But alas, Tuesday is a day to enjoy the sunshine. To be grateful for whatever we have to be grateful for. It’s a day to not think about the fact that your little guy is home from school with strep throat, or that the bills need to be paid, or that the lawn has weeds. It’s a day to be thankful we had a doctor to see when the little one was sick, or there was some money to pay the bills, or that a nice gentleman came by to spray the weeds. It’s a day to celebrate the little things. I’m happy that my new book is in it’s final edits. It’s really close. So close. In fact, an editor is putting her magic touches on it right now and will send me notes by the end of the week. Once the words are all shiny and pretty and new, I will send the book to my agent. I hope she likes it. Today is Tuesday and I am thankful that I can write here, in my blog. Maybe one day, in the future, it could be a Friday or a Sunday or even a “hump day,” oh my! I could be writing about what my agent thought about my new book. Or maybe I’ll write how I actually, finally, sold my first book. Wouldn’t that be lovely? This is why I like wistful Tuesdays. Tuesday is a day to wish and hope and dream.